Allah has enabled opened our eyes to a fact in the Qur’an that we would like to share. Have you ever wondered why the Qur’an despite addressing both men and jinn does not address the jinn very much? Well, we were surprised to realize that the Quran addresses us and the jinn many times apart from Surah Rahman; it’s just that we were oblivious to it. If you never had a child and you go to a supermarket; you might not notice the baby items much since your mind completely filters them out, right? If you have a child and you go to the same supermarket your conscious mind will suddenly realize that there are baby items you never noticed before; this is because you mind is searching for every baby item to compare the prices and qualities for your child. [Keep this example in mind as we will show you how the Qur’an addresses the JINNS much more than you realize; you will surely appreciate this considering jinns are a reality.] Let us begin with the basics; what is the purpose of jinns and men? By looking at (Qur’an 32:13) above, it becomes clear that the word nafs (usually translated as soul) applies for not only mankind but jinns too. This opens up other angles we couldn’t reflect on all the Ayats which contain the word nafs. Note: Though in (Qur’an 51:20-21) we are told to reflect about ourselves; there are limits. Just as a male is not allowed to reflect on a naked woman as it is prohibited; you can’t reflect on jinns by trying to get close to them and communicate with them. Everything is permissible except what has been made impermissible by the Quran and Sunnah. The believing jinns enter Paradise too as seen in Surah Rahman. Note: It is best to remind ourselves that the whole Quran is from Allah and that sometimes in order to understand one part of the Quran you would need to understand other part(s) of the Quran. Remember that the Qur’an explains the Qur’an; for example reading every Ayah from the Quran except the Ayats from Surah Kahf might make you reach the conclusion that Iblis was an angel and not a jinn because it is in Surah Kahf where we learn that Iblis was actually a jinn and not an angel. It is at this point that we can also state that the good titles such as believers (muminuun), Muslims (one who submits to Allah), Muttaqun (those who guard themselves) etc are not limited only to men but can also include jinns. (Qur’an 72:11), (Qur’an 72:14) and (Qur’an 46:29-31) are Ayats which prove these good titles can belong to both men and jinns. Similarly it is also best to state that the bad titles such Satans, disbelievers (Kuffars), Zalimun (wrong-doers, polytheists), Mufsidun (those who corrupt) etc cannot be limited to only men or jinns but they cover both categories of men and jinns. (Qur’an 6:112), (Qur’an 6:130) are Ayats which prove these bad titles can belong to both men and jinns. Now please read the following Ayats we have selected keeping in mind that the word qawm and nafs includes both mankind and jinns; from this you will see the point of view jinns have when listening to the Qur’an. If we read (Qur’an 2:285-286) we see in the last part we as men seek victory against the disbelieving people (qawm) of both men and jinns (including Satan and his fellow jinn followers too). When the jinns listen to this last part they also realize that the disbelieving people (qawm) of both men and jinns are referred to here. If we read (Qur’an 7:52), we see that the Book has not been sent down only to qawm of men but also the qawm of jinns. Remember the jinns addressed their fellow jinns as qawm meaning there are also other qawms of jinns and not of men alone. The fact that this Ayat generalizes all qawms surely means it covers both men and jinn qawms. Assuming we are reading Surah Rahman for the first time on this earth from Ayat 1 to 12, we find no mention of the jinns. Then suddenly in the 13th Ayah, Allah addresses two groups of people and at this point the jinns are probably shocked and are wondering if the second group being referred really is them. If we continue reciting up to the 16th Ayah is when the jinns realize that they really are being addressed as they were perfectly explained in the 15th Ayah. What else do we get from Ayats 1-16? Isn’t it similar to (Qur’an 13:3-4) above? If you look at (Qur’an 13:3-4) and (Qur’an 55:1-16); the favours of Allah are displayed and then we (men and jinns) are asked to pounder on them and be grateful. The jinns who believed and knew Musa must have really been happy when (Qur’an 28:3) was first recited to them. Imagine that they knew Musa and now they are about to get true facts about Musa from Allah. But this does not apply only to the qawm of jinns who believe but also to the qawm of men who believe. The normal time for humans to sleep is at night and the normal time for the jinns to be active is at night as evidenced from the Quran and Sunnah. Just like how some of mankind are active at night; there are some jinns that are also active during the day [eg the jinns that work for magicians normally go by the schedule of the magician]. But do jinns sleep? That is a tough one. When talking about the nafs in (Qur’an 39:42) we see that Allah could either be talking about a specific group of nafs (eg only humans) or all nafs (eg humans, jinns etc). There are some things we may never know fully as seen in (Qur’an 17:85), that we have been given little knowledge. Either way both men and jinns have a lot to pounder on this Ayat; more so for jinns who have the ability to influence the dreams of man; such as when a Satan jinn gives a man a nightmare by Allah’s Permission. The term Ummah really needs to be studied; what makes it different from qawm? In (Qur’an 11:118), Allah is informing His Messenger that if He had so willed, He could surely have made mankind one Ummah but they will not cease to disagree. Here we see that even within categories such as men, jinns, birds etc; there are different Ummahs within these categories. Just looking at different kinds of birds all around the world be it crows, vultures, hoopoes etc; what is the common thing which they are all similar in? It is quite simple; they are Muslims. Note: An Ummah is not limited to more than one individual as seen in (Qur’an 16:120) where Ibrahim is identified as an Ummah by himself. That is why there the terms, “the Muslim Ummah”; “the Ummah of Prophet Muhammad sallallahu alaihi wasallam” exist. But as we all know that Muslims are not all identical; there are some who are human (blacks, white, Chinese, Japanese etc) and others are jinns (one that flies through the air, one that are snakes and dogs, and one which stay in places and travel about). This is not only limited to the Muslims but there are also different kinds of Christians (jinns and humans [eg blacks and whites, Chinese, Arabs, etc]). The term qawm (people) is different from Ummah in that it generalizes everyone according to a certain benchmark. 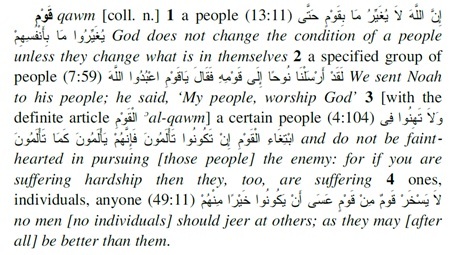 For example the people (qawm) of Nuh are all the people regardless of their race or belief that Nuh was sent to. We very well know that there were few believers and others disbelievers; all still being referred to Nuh as a benchmark as his people (qawm). Even if the jinns might not have jinn Prophets/Messengers [see (Qur’an 22:75)]; they certainly have warners. Not just simple warners but warners who warn repeatedly. درس means to study and مدرسة is a school, or a place of studying. مرض is sickness, and ممرضة is a nurse, or someone who takes care of the sick. طبخ is to cook, and مطبخ is a kitchen, or a place of cooking. The jinns in (Qur’an 46:29) are called Mundhirun generally meaning they spread the word of Islam amongst jinns (believing and disbelieving) with all of their best efforts. And Allah knows Best. Another proof that the jinns know about Allah and the Day of Resurrection can be seen in (Qur’an 37:158) below. The jinns are constantly exposed to the unseen (eg angels, ) and so from this perspective one can understand (Qur’an 37:158). The root word ayn-sh-r also carries the meaning of relatives, friend and kindred and that is why when you are looking at the following hadiths you see we Muslims (from mankind) are being told about our brothers among the jinns; which brothers? The Muslim brothers of course. Remember however that Muslims are not to communicate and work with Muslim nor non-Muslim jinns as we explained in our 135th article (see http://aljumaareminder.com/reminder/135-iarlg-magicians-part-10-surah-rahman-prohibits-interaction-between-men-and-jinns-date-23rd-september-2016-22nd-or-23rd-dhu-al-hijja-1437/ ). It is most likely that Muslim jinns assist us without letting us know by suppressing the evil jinns and such but we should put our reliance on Allah. Prophet Muhammad sallallahu alaihi wasallam never worked with jinns even if the situation was dire and even if he badly needed information from enemy camps; he would send out spies instead of jinns. He would send human spies even if it was risky to obtain information. This is in itself a Sunnah which we have to follow. If you have read Surah Mulk then you know that (Qur’an 67:19) is mostly referring to human beings more than jinns. The jinns can reflect on this Ayat from our point of view to gain imaan just like we Muslims gain imaan from Ayats where Allah addresses the Children of Israel etc. But this Ayah can also be reflected on by the jinns who can’t fly because most of the times they will see the birds above them. Those jinns who fly while the birds are still above them or land and the birds are still above them can also internalize this Ayat. Those who fly higher than the birds might start to think that they have beat (Qur’an 67:19) but Allah reminds them at the ending part of (Qur’an 67:19) that He is the All-Seer of everything and that they should not get cocky. In Surah Nahl is where it gets interesting. What do you notice reading (Qur’an 16:79). This Ayat openly states that there clear Ayat for the people (qawm) [of men and jinns] who believe. One of the major things which makes it a bit different from (Qur’an 67:19) is that it only urges us to see the birds held (flying) in the midst of the sky; meaning from any angle. The jinns who fly higher than the birds and watch them from above or the human beings who are in airplanes above the birds and watch them have a lot to gain from this Ayat. It doesn’t have to be above the birds but even sideways too. Sometimes the birds are seen sideways via satellites recordings etc. What we do know is that Prophet Muhammad sallallahu alaihi wasallam was sent as a mercy to all the worlds. The qawms of all the worlds may not be limited to just jinns and men. There might be other qawms we don’t know about who are also reciting the Qur’an; but Allah knows Best.